The Obama administration skirted key U.S. sanctions to grant Iran access to billions in hard currency despite public assurances the administration was engaged in no such action, according to a new congressional investigation. The investigation, published Wednesday by the Senate Permanent Subcommittee on Investigations, further discloses secret efforts by top Obama administration officials to assure European countries they would receive a pass from U.S. sanctions if they engaged in business with Iran. The findings confirm earlier reports by the Washington Free Beacon surrounding efforts by the Obama administration to go above and beyond the terms of the landmark nuclear deal to appease Iran and grant it billions in hard currency, as well as access to the U.S financial system, despite multiple assurances to Congress this was not the case. Congressional investigators have now confirmed that the Obama administration ordered the Treasury Department to issue a secret license granting Iran access to the U.S. financial system and American dollar, a process that played out at the same time these senior administration officials were testifying to Congress that they were not engaged in such activities. The investigation confirms allegations by many in Congress that the Obama administration was engaged in covert diplomacy with senior Iranian officials beyond the nuclear agreement to help Tehran obtain billions in hard currency, cash that was later used by the Islamic Republic to fund its ballistic missile program and fighting forces operating in Syria and across the region. "The Obama administration misled the American people and Congress because they were desperate to get a deal with Iran," said Sen. Rob Portman (R., Ohio), chairman of the Permanent Subcommittee on Investigations. "Despite claims both before and after the Iran deal was completed that the U.S. financial system would remain off limits, the Obama administration issued a specific license allowing Iran to convert billions of dollars in assets using the U.S. financial system." Several days after the Obama administration announced the implementation of the nuclear agreement, U.S. officials were contacted by Bank Muscat in Oman, which was seeking to convert nearly six billion dollars on Iran's behalf. Bank Muscat petitioned the Obama administration to allow it to access the U.S. dollar in order to conduct the transition, which was to be carried out from Omani rials, into U.S. dollars, and then into Euros. That money would then be transferred into the Central Bank of Iran, or CBI, which was long designated for sanctions by the United States as a result of its efforts to fund Iran's terror operations and nuclear program. "The inability to convert the funds held at Bank Muscat through the U.S. financial system frustrated key Iranian officials," according to the congressional investigation. "On January 24, 2016, a lead Iranian negotiator, wrote to his U.S. State Department counterpart, complaining that Iran could not convert its assets as it requested." While such transactions remained prohibited under the nuclear agreement, also known as the JCPOA, senior Obama administration officials in the State and Treasury Departments scrambled to find back-door methods to appease Iran. In one email obtained by congressional investigators, a Treasury Department official says that the United States committed much more to Iran than was publicly disclosed at the time by the Obama administration. "Yikes. It looks like we committed to a whole lot beyond just allowing the immobilized funds to settle out," the official wrote. While the administration was not obligated to conduct any such transactions on Iran's behalf, Obama administration officials decided to pressure the Treasury Department to issue a secret license permitting Iran to access the $5.7 billion from Oman's Bank Muscat using the U.S. financial system, according to the investigation. "Treasury Department officials began working on a specific license authorizing Bank Muscat's transaction," the report finds. "A specific license allows specified transactions to occur that would otherwise violate U.S. sanctions." The license did not have to be publicly disclosed and it was ultimately issued during a time when top Obama administration officials were testifying to Congress that they had no intention of permitting Iran access to the U.S. financial system. "On February 24, 2016, the Treasury Department issued a specific license to Bank Muscat to authorize the conversion of Iran's rials to euros through ‘any United States depository institution … involved as a correspondent bank … where such foreign exchange conversion provides an indirect benefit to persons subject to the jurisdiction of the Government of Iran,'" investigators found. "Iran was then free to use a U.S. bank to act as the intermediary (called a ‘correspondent ban') to convert its assets at Bank Muscat (Omani rials) through the correspondent bank account in the United States (U.S. dollars) to a designated bank in Europe (euros)." The U.S. Office of Foreign Assets Control, or OFAC, subsequently lobbied two U.S. banks to convert the funds on Iran's behalf. "U.S. officials at OFAC contacted both of the banks to encourage them to convert the funds," according to the report. "Convincing a U.S. bank to convert the funds was crucial." Obama administration officials then conducted a series of back-channel conversations aimed at getting top officials to pressure these banks to carry out the illicit transactions on Iran's behalf. "To further encourage the banks, one U.S. government official wrote, ‘I agree it would be a good idea to have [Secretary] Lew engage [the U.S. bank]," according to emails obtained by investigators. 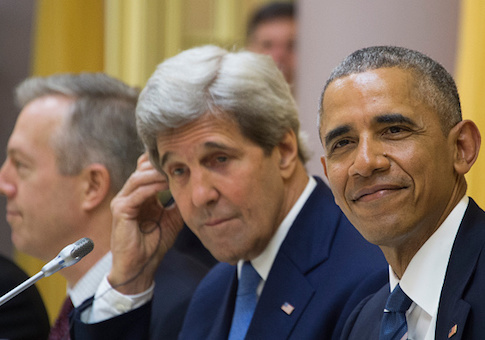 "If they refuse we can suggest [Secretary] Kerry will call, which will drive them nuts." Both of the U.S. banks eventually declined to carry out the transaction due to concerns over U.S. sanctions laws. However, the effort did not end there. Officials in the Treasury and State Departments held private conversations to find other avenues to help Iran receive the billions. "Treasury and State Department officials sought other ways to move the funds. Discussions involved coordinating with the Federal Reserve Bank of New York, the Bank for International Settlements, and the Central Bank of Germany," according to the report. These efforts also were unsuccessful and the administration never ultimately found a way to enable Iran access to the $5.7 billion, which was later converted by Bank Muscat and Iran outside the U.S. financial system. Iranian officials expressed outrage at the United States over the failed bid, which prompted another series of discussions with these Iranian official about ways the Obama administration was going beyond the terms of the nuclear agreement to help Iran obtain hard currency. The United States "exceeded our JCPOA commitments by OFAC's issuing a license to enable Bank Muscat to work with any U.S. financial institution to facilitate the conversation of assets in the banks from rials to other non-dollar currencies," one State Department official wrote to the Iranians in 2016. This shadow diplomacy played out far from the public spotlight and occurred while Obama administration officials were publicly telling Congress a different story. Sources familiar with the issue told the Free Beacon similar measures must have been taken to facilitate other transactions that the Obama admin hid from reporters, including the taxpayer purchase of Iranian nuclear material that Tehran produced in violation of the deal. "As the Treasury and State Department worked behind the scenes to help Iran access the dollar, the message to Congress remained the same: The JCPOA did not allow Iran to access the U.S. financial system," the report notes. The report further discloses efforts by top Obama administration officials to lobby European countries to reengage in business with Iran, despite U.S. sanctions laws. In one secret meeting, U.S. officials "signaled that it would not aggressively enforce violations of the new sanctions regime," investigators found. "For example, during a [pro-Iran] roadshow in London in March 2015 with representatives from 10 major global financial institutions, the head of the U.S. Treasury Department's Office of Foreign Asset Compliance [OFAC] assured attendees that '95 percent of the time OFAC sees an apparent violation it results in a simple warning letter or no enforcement action,'" according to minutes of these meetings. "He explained OFAC would only take action in egregious situations." This entry was posted in National Security and tagged Iran, Obama Administration, Sanctions. Bookmark the permalink.